Envision the stereotypical scene in the movies: gullible buyer steps onto a used-car lot, looking for a bargain. He haggles with the sleazy salesman and kicks the tires of the cars he is considering. What? Why kick the tires? Theoretically, this was a way to figure out if the salesman’s story was true and the little old lady who only drove to church on Sundays really did take good care of the car. Checking the tires could show if they were properly inflated, had even wear (indicating good alignment and regular tire-rotation), and were replaced before the tread was totally bald. Why talk about this on a blog about adventures? In the same way that taking proper care of tires hints at a well-cared-for vehicle, taking proper care of one’s feet increases the probability of completing a successful long-distance hike. At the first hint of a “hot spot” it is important to stop and cover that area. 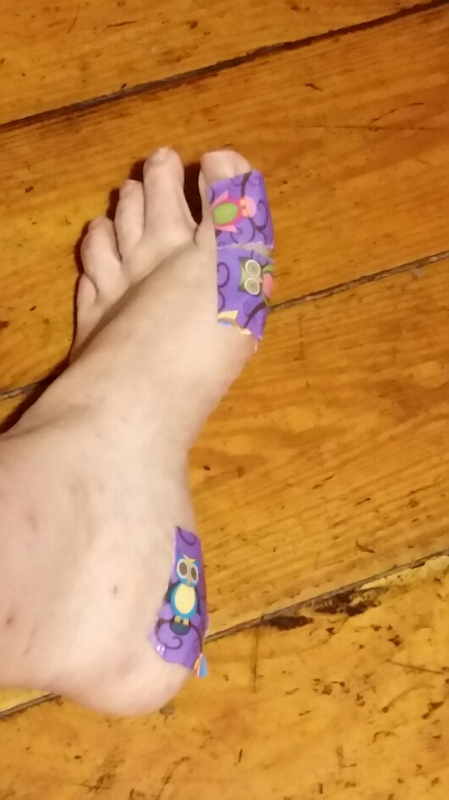 (A “hot spot” is any bit of skin that feels irritated, tingly, or “on fire.”) Many things can be used to lessen friction: moleskin, bandaids, cloth tape, duct tape. This simple step is the most effective way to prevent blisters. Next, get the right socks for YOUR boots and YOUR feet. Most hikers have a favorite combination they swear by. 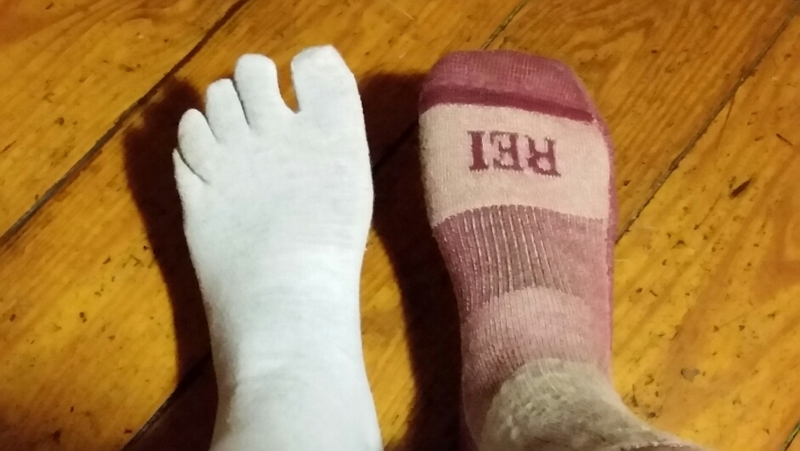 For many, a thin liner sock and thicker outer sock work well to lessen friction on skin. I usually carry a second set of dry socks to switch into if needed on wet days. My little toes normally curl under the next toes, which caused huge blisters last fall. Using injinji toe sock liners this trip have solved that problem. Of course, it is important to choose boots that fit comfortably. Getting input from others is fine…but you MUST have the right fit for YOU! 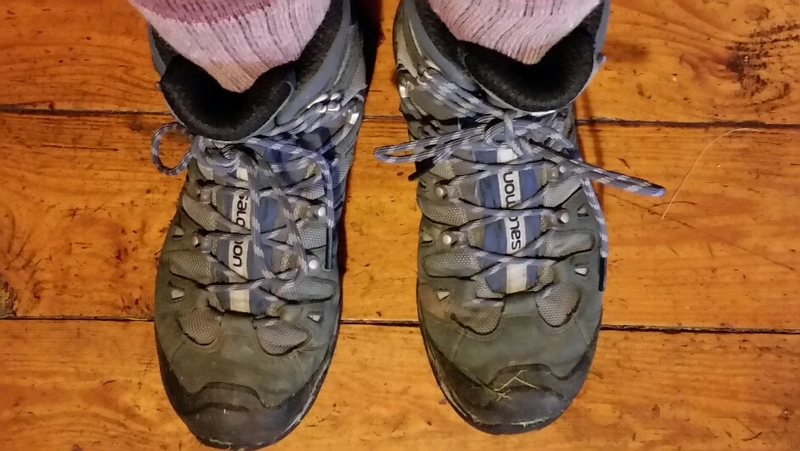 With wide feet and a need to wiggle my toes, plus a desire for strong ankle support, I love my Salomons. As a hiker, I won’t get far if my feet are uncomfortable or injured. Good foot care is critically important to success. When buying a used car, go ahead and kick the tires if you want to. 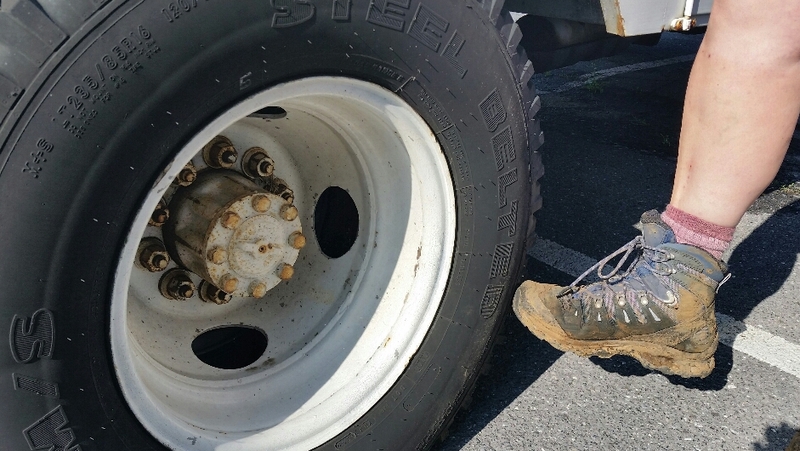 But when backpacking, protect those feet and please don’t kick the tires…or anything else! ← Are we THERE yet?! One would hope so! Have fun! She said remembering the broken toe of last fall… I love following your adventures! Haha! Perhaps I learned my lesson? !